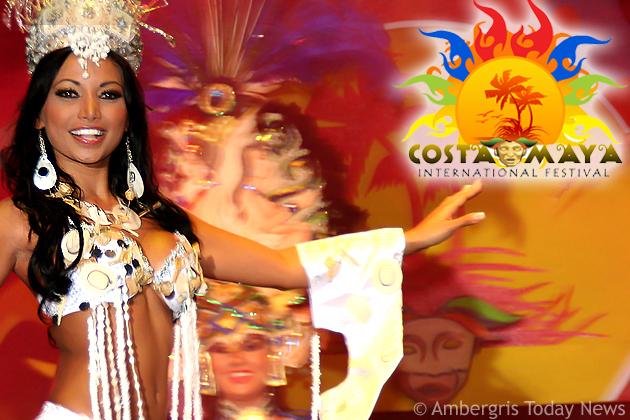 The San Pedro International Costa Maya Festival has officially announced its festival dates for 2011. The largest festival in Belize has been confirmed to run from August 4 to August 7, 2011. And this year marks Costa Maya Festival’s 20th Anniversary! Something special is underway. Thursday, August 4 – Opening night will feature comedic performance by Guest Comedian (previously reserved for Sunday, closing night), spectacular opening night performances and special entertainment. Friday, August 5 – Welcomes the ever popular Reina de la Costa Maya Pageant (Miss Costa Maya). All seven Central American countries and Mexico have confirmed their participation in this year’s pageant. Coordinators have already started working on the theme of the pageant, which is expected to tie in with the Mayan 2012 celebrations that most Central American countries are promoting at the moment. Expect great things for this year’s pageant once again. Entertainment will follow after the pageant. Saturday, August 6 – International Night is set to bring another spectacular international artist to highlight an evening filled with more entertainment both from local and regional artists. Sunday, August 7 – The biggest changes comes on the last night of the festival. Activities move from the festival ground to Central Park for an all-day Beach Party with live music, DJ competitions, games and a repeat of the Triathlon that was very popular last year. There will no longer be scheduled performances during the evening, but the mechanical rides and food stalls will be accessible to the public at night. The FUN moves to Central Park on Closing Day for the Costa Maya Festival. The ball is rolling and the Costa Maya Festival Committee has started to work in looking for the best performers from the region and internationally to grace the stage of the biggest and most popular festival in Belize. More updates coming soon! I was expecting the Costa Maya Festival to bring a more exciting artist for Saturday since they are celebrating 20 years. I remember listening to Marisela when I was like 10 years old but I am not sure I want to see her in concert. They sould bring artists like Alejandra Gusman, El Buky or Pitbull just to name a few. Come on guys we need something more hip and modern to get the crowd a live! Changes of the days are great but we need a better artist for Saturday Night! Please! Congrats to the Costa Maya Committee! Marisela is the best!!! It will be a huge success!!!! How much will the entrance for all 3 nights will cost$$..?? Season ticket prices and door entrance prices have not been finalized just yet. Ambergris Today meets regularly with the Festival Committee and we will be announcing these and other updates in coming weeks leading up to the festival. Finally some chnages! They should get the same committee that organizes Ms.San Pedro for the pageant. The Pageant is always boring! I do Believe that the committee should bring an artist that will everyone could enjoy especially the youth!!! Hello.... Don't bring any Temerarios or Juan Gabriel... those artists are for the old people!!! Remember alot of people from the city attends this festival!!! I am a senior person and have read all the comments and they are sensible. The artist should be pleasing to the younger crowd because after all they are the ones that go up to the satage to hype up the artist and the festival. Get something hype and modern. If they young people don't come alive, the festival will be boring cause the older folks don't applaud nor shout.. you know what I mean?